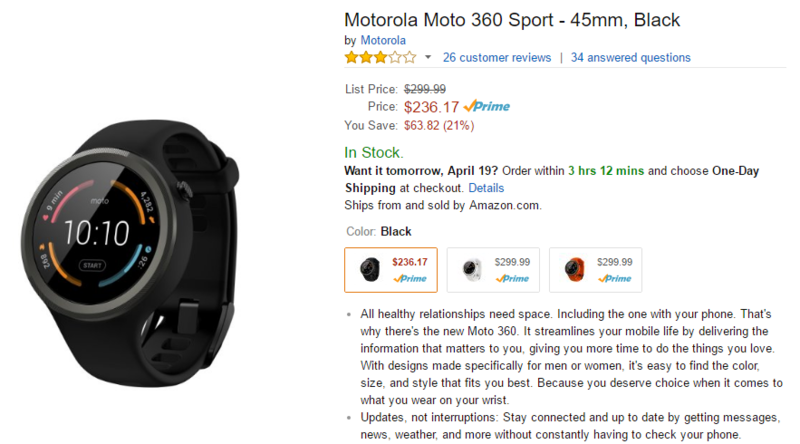 The 360 Sport is similar to the Moto 360 v2 with a Snapdragon 400 SoC, heart rate sensor, and crown button at 2 o'clock. It also has a 1.37-inch transflective display that works great outdoors, built-in GPS, and a number of fitness-related features. It's a nice enough fitness watch, but it's not as stylish as other $300 smart watches. But hey, at $236 it's more plausible. The silicone band is non-removable, so you're stuck with the black one if you pick this watch up. The white and orange versions are still priced at $300.